Librarians from Emory's Manuscript, Archives, and Rare Book Library and the library's Data Center envisioned building a base of historic maps from library mao collections that would allow scholars to research aspects of the history of Atlanta, especially its racial history. As a first step the librarians digitized and georeferenced a 1928 Atlas of Atlanta. At the same time the library also digitized the 1928 city directory of Atlanta, which was then proofread and marked up in TEI. In addition funeral home records from 1930 were transcribed and marked up to be added to the text collections. The addition of texts encoded in TEI allows flexible searching, giving the public access to the text records. The GIS work allows researchers to visualize and analyze complex patterns of development. This poster will show the work being done in the library by the volunteer labor of a variety of librarians, and some of the connections between the TEI and GIS use of the data. The text portion of the research is hosted in an eXist database, and can allow queries from public users and researchers to search names and street locations. To prepare the data staff and students proofed the city directory, and marked up the address listings in TEI. Records from the funeral home from the same period have been transcribed and will be encoded and available for searching also. The xml-encoded city directory document allows the production of lists of names and addresses in various forms to automate much of the geocoding. When the geographic references from the geocoder are added to the coding in the city directory, a search by name will be able to bring up map references showing the locations associated with that name. Web based users can search and to locate names and streets with Google Maps or Google Earth using the georeferenced locations harvested from the geocoder and added back the TEI encoding. The GIS coding allows researchers with access to GIS software to pursue research via the data encoded in layers of the geographic maps. 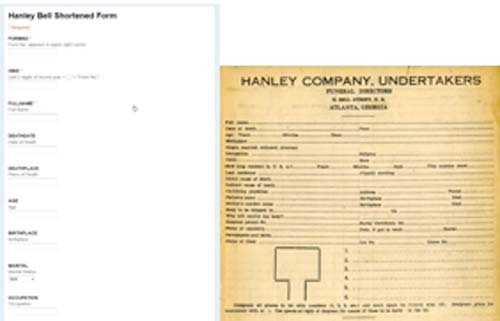 While the construction of a geodatabase is core to the GIS users, the development of a geocoding reference layer and a specific address locator is what enables us to construct geocoding tools for Atlanta circa 1928. The geocoding reference layer's construction is facilitated by the automation allowed by the TEI encoding of the city directory. A geocoder transforms data such as addresses into a location on the surface of the earth so the data can be quickly plotted on a map. Using a Geographic Information System (GIS), this project will create an application similar to Google Maps, but it will be a digital research tool for Atlanta from the late 1920s through the early 1950s, not for contemporary Atlanta. The geocoder assigns addresses and maps all of the 250,000 building footprints in Atlanta and its environs in 1930. Students, faculty, and researchers can then add layers and tag attributes to a series of addresses in the historic city. With this research tool, researchers interested in Public Health could explore the correlation between topography, elevation, and incidence of disease in Atlanta, urban historians could map out more complicated, nuanced, and fluid racial residential patterns, political scientists could map the locations of fire hydrants, manhole covers, and sidewalks to provide accurate data about how segregation influenced city services, and historians could map the “watersheds” of churches and discover how far members of a particular congregation lived from a particular church. 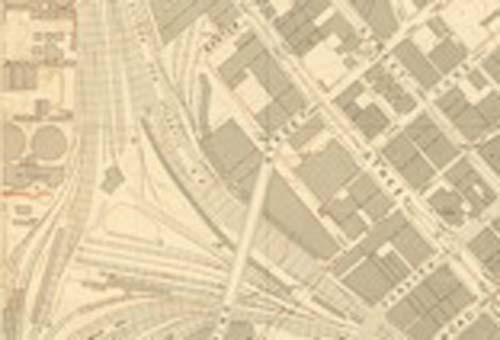 The goal of the project is to create a digital tool to visualize and analyze historical Atlanta by providing new ways to integrate spatial and non-spatial data in the classroom and in research. This combination of GIS technology and unique datasets will change the way Jim Crow Atlanta is studied.